There are lots of community, charity, tourism and business awards launched every year, local as well as national. But when I ask my contacts if they are applying, the usual response is ‘No’. But there is plenty of anecdotal evidence, articles and blogs research to suggest there are benefits to smaller organisations as well as large corporates. The value and impact on SMEs derived from winning business awards seem to be both short term and long term and there is tremendous PR value in entering and winning an award. Organisations may be worried that they won’t win and that is seen as a failure but far even the process of entering the awards can be good for organisations and staff. 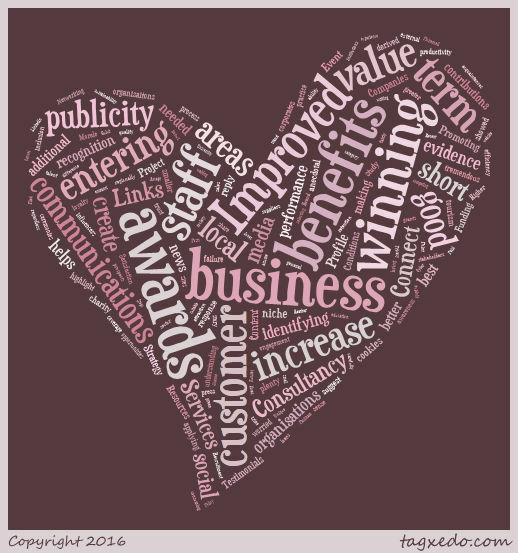 So what are the 10 Benefits of Entering Business Awards? Focus – the research and evidence gathering helps with identifying and understanding key performance areas and best practice. It can also highlight areas where improvements are needed. Higher Customer Satisfaction – there is increased customer awareness, recognition and credibility which increases customer trust and loyalty. Staff Morale – awards can create a ‘buzz’, leading to better engagement with staff, greater inclusion and productivity. The efficiency of staff can even increase from an enhanced sense of pride. Networking – at award ceremonies there are opportunities to take staff, customers or influencers and good prospects of meeting new or renewing old acquaintances regardless of being shortlisted or winning. Enhanced Brand Profile and Recognition– in your sector nationally and regionally and also in your local area by competitors, suppliers, the general public and stakeholders. Recruitment – better quality applicants, attraction and retention of talent. Improved Financial Performance – whether this is an increase in sales, ability to get grants, loans or bring in sponsorship. For SMEs it could increase the value of good-will in the business and credibility with financial institutions. Establishing a Niche or Unique Selling Point – by selecting a category carefully you can create a niche that make you stand out from your competitors. From sustainability to green awards, from contributions to society, education or training to improving the lives of others, show how you are making a difference. Enhances Business Competitiveness – if you exploit the short term and long term benefits of winning an award then all the above can contribute to improved competitiveness. Yes it can be fairly challenging and time consuming but winning or being shortlisted is a big bonus and in the case of some local awards you may not be competing against too many other entrants. So what are you waiting for? If you need help in identifying suitable awards or writing the application form, contact me or talk to your marketing or PR agency.